Milling Shoe can be divided into three kinds flat-bottom or concave-bottom milling shoe, guide milling shoe and cone milling shoe, according to its structure and shape. At the milling surface, the carbide particles are built up by welding, which plays a part of self-milling. It is used to mill the fallen substances, such as bolt, nut, tooth wheel, slip dog, fittings for deep-well pump, etc. Here we got some prise as follows. 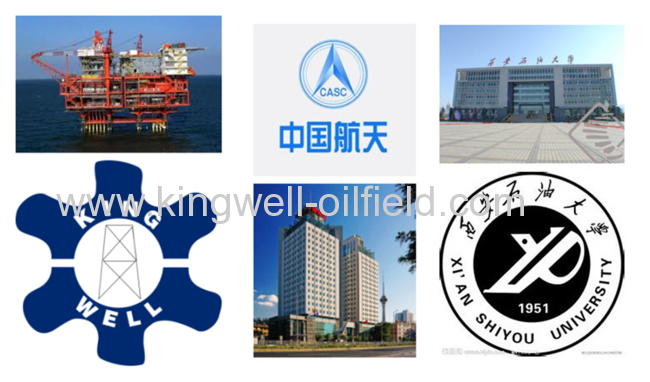 Kingwell has an ongoing relationship with Xi'an Petroleum University and built up long term cooperation with China Aerospace Group for more than 10 years. Design Department is familiar with CAD and Pro-E facilities and has on rolls qualified & experienced engineers. Now, they are engaged in development of new products as required in the market place. Kingwell' products are validated in-house in a Test Well, a Sub-surface Type Test Facility with simulated well conditions up to 15000 psi Differential pressure , 400°F and Max 450°F. Below are our cooperative partners. We own the world-class facilities with professional laboratory technicians. The main facilities are Surface Testing (Hydraulic Testing Unit), high temperature heat treatment furnaces, API Gages (Master & Working), Profile Projector, tensile testing machine, pressure sensor and data acquisition system, Universal Testing Machine, Hardness Tester, Nitrogen Pump, Function Test Pump, Ultrasonic Thickness Tester etc. All the goods must be tested by several processes and must be qualified when packed.